- Human Evolution You Figure it Out! Sites with simple clear logic so that even creationists can understand. PBS Evolution Video explores the scientific meaning of the word "theory"
That life on Earth during the past 3 billion years has evolved from single-celled organisms to complex and diverse creatures, including humans, is indeed a fact. Evo Biology, Wells, Thermodynamics, etc. The Imminent Demise of Evolution? Creationism's Longest Running Falsehood. Fossil shows how whales evolved from walkers to swimmers The fossils of a possible whale ancestor that walked on land 50 million years ago is giving us new insights on how whales evolved into swimmers, according to findings published the April 2019 issue of Current Biology. The fossil was found in Peru, and researchers think it may have made its way from West Africa, indicating quadrupedal whales already could survive such a long journey at sea. Cell-like chemically active droplets may contain clues about origins of life. Chemically active droplets that grow and divide like cells may have been key to the origins of life, according to a study published in the December 2016 issue of Nature Physics. Chemically active droplets can exhibit cycles of growth and division that resemble the proliferation of living cells. "It makes it more plausible that there could have been spontaneous emergence of life from nonliving soup," said study co-author Frank Julicher. Discovery of five new species of tetrapod that lived between 360 million and 345 million years ago may help bridge the gap of 15 million years in the tetrapod fossil record and reveal more about how creatures moved from aquatic life to living on land. The new species plus seven other fragmentary fossils are described in a study published in the December 5th 2016 issue of Nature Ecology & Evolution. Evidence that Evolution Trends Towards Increasing Body Size - A new study of the evolution of marine animals has found evidence that Cope's Rule, which hypothesizes that animal lineages evolve toward larger body size over time, is true. The researchers analyzed data that spaned over 500 million years and included more than 17,000 marine animal species. They found that body volumes had increased by over five orders of magnitude since the first animals evolved. Modeling also suggested that such a massive increase could not have emerged from neutral drift from a small initial value. Science 2015, 347, 867-870. 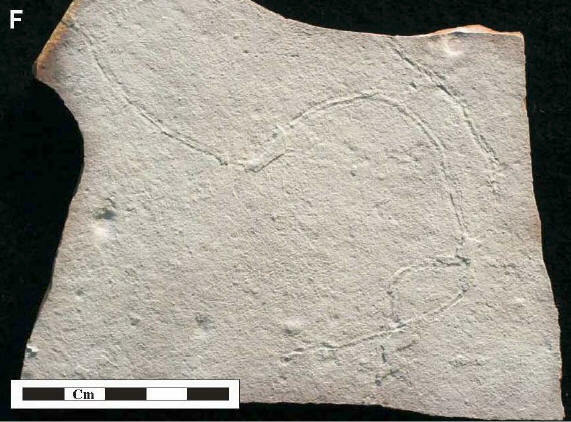 Fossilized 530 Myr Embryos Found in China - Fossilized embryos of a previously unknown creature have been found in southern China, dating back between 521 million and 541 million years, during the Cambrian period. It remains a mystery what these embryos would have grown up to become but some of the spheres had polygonal patterns that look similar to those seen on fossilized embryos from a Cambrian worm-like creature. "We found over 140 spherically shaped fossils, some of which include features that are reminiscent of division-stage embryos, essentially frozen in time," said University of Missouri researcher James Schiffbauer. See the full paper in the March 2014 issue of the Journal of Paleontology. The "Cambrian Extinction" may not have happened according to the report in the May 13th 2010 issue of the journal Nature. A new fossil find in Morocco shows that the disappearance of Burgess Shale fossils is not due to an extinction event, but more likely reflects the absence of preservation of similar soft-bodied organisms in later periods. The discovery of diverse soft-bodied creatures provides a link between earlier communities and the latter "explosion of life". Why Ray Comfort is wrong - On November 11th, 2009, Ray Comfort, an evolution denier, distributed copies of Darwin's first book on college campuses, with an introduction written by him making a long list of bizarre claims about Darwin and evolution. Help fight this mis-information by printing out this one sheet rebuttal and distributing it where needed. EXPELLED EXPOSED ! A detailed look at the Ben Stein movie Expelled: No Intelligence Allowed. We'll show you why this movie is not a documentary at all, but anti-science propaganda aimed at creating the appearance of controversy where there is none. Fossil Crocodile is "Missing Link" - It has a mix of morphological traits common in prehistoric crocodiles and in the ones that exist today. 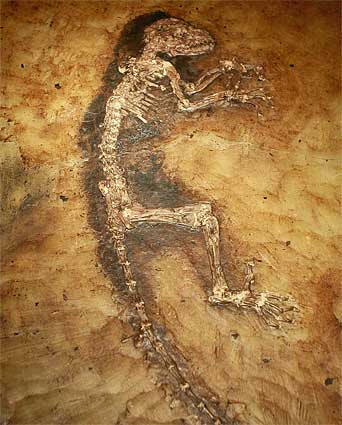 The fossil of a land-bound reptile that could be a link between prehistoric and modern-day crocodiles. The 80-million-year-old predator, dubbed Montealtosuchus arrudacamposi, is 5.5-foot-long (1.6-meter-long) and was a long-limbed and extremely agile animal that roamed arid terrain in what is now the Brazilian countryside, As a missing link to prehistoric crocodiles, it offers us an excellent opportunity to study the evolutionary transition of these animals. For more see National Geographic News (Feb. 2008). Evolution's Greatest Mistakes - As miraculous as living things might seem at first glance, a closer look reveals that evolution's blind blunderings often fall well short of perfection. Claire Ainsworth and Michael Le Page peek under the hood of life to assess the parts and processes where things seem to have gone spectacularly wrong. New Scientist 195.2616 (August 11, 2007): p36 (4). Twin fossil find adds twist to human evolution - unearthed in Kenya, they show that two ancestral human species seem to have lived cheek-by-jowl in the same area, much as gorillas and chimpanzees do today. Both skull fragments, discovered by Fred Spoor of University College London and his colleagues, were found near Kenya's Lake Turkana, adding to the impressive list of early human fossils unearthed here. One of the fossils, an upper jawbone from the species Homo habilis, is dated at 1.44 million years, younger than most fossils of this species. Read more in the 8/8/2007 issue of the journal Nature. The Bacterial Flagella Evolved not Designed. In an article published on-line 9/6/2006 in Nature Reviews Microbiology (or see short summary), Mark Pallen of the University of Birmingham and Nicholas Matzke of NCSE, review the evidence for the evolution of the bacterial flagellum. They handily dismiss the need for any great conceptual leaps in creating a model of flagellar evolution and speculate as to how an experimental program focused on this topic might look. Growing evidence that evolution is not just real but is actually still happening to humans today. "From 1970 to 2000, the view was that although natural selection is very important, it is relatively rare, That view was driven largely because we did not have data to identify the signals of natural selection. In the last five years, there has been a tremendous growth in understanding how much selection there is. Everywhere we look, there appears to be very widespread signals of natural selection in many genes and many processes." wrote Dr. Jonathan Pritchard, a geneticist at the University of Chicago, in a recent article in PLoS-Biology. Our insight to evolution and natural selection has deepened as we have gained the ability to read the human genome. Irreducible Complexity Refuted - By reconstructing ancient genes from long-extinct animals, scientists have for the first time demonstrated the step-by-step progression of how evolution created a new piece of molecular machinery by reusing and modifying existing parts. The findings offer a counterargument to doubters of evolution who question how a progression of small changes could produce the intricate mechanisms found in living cells. This experiment refutes the notion of "irreducible complexity". A Catholic Scientist and Priest Looks at Evolution - Father George V. Coyne, Vatican Observatory Director and Jesuit, shares his convictions that (1) the Intelligent Design (ID) movement, while evoking a God of power and might, a designer God, actually belittles God, makes her/him too small and paltry; (2) our scientific understanding of the universe, untainted by religious considerations, provides for those who believe in God a marvelous opportunity to reflect upon their beliefs. Creationism: - The invincible ignorance that results from sacrificing scientific knowledge to dogmatic faith. but to put an end to everlasting error."